Home > Literary Criticism. Folkloristics. Cultural Studies. Editorial board: V.T.Polishchuk, Doctor of Philological Sciences, Professor (executive editor); M.V. 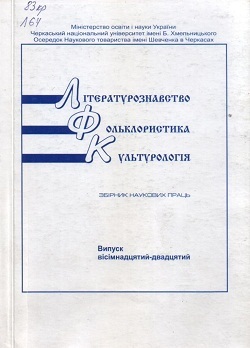 Koretska, Candidate of Philological Sciences (executive secretary); Andrzej Baranov, Doctor of Philological Sciences, Professor (Lithuania); L.I.Kavun, Doctor of Philological Sciences, Professor; S.A.Kytova, Candidate of Philological Sciences, Doctor of Cultural Studies, Assistant Professor; O.S.Kychenko, Doctor of Philological Sciences, Professor; N.V. Korniienko, Doctor of Philological Sciences; I.V.Limborskyi, Doctor of Philological Sciences, Professor; M.K.Naiienko, Doctor of Philological Sciences, Professor; V.Y.Panchenko, Doctor of Philological Sciences, Professor; V. I.Pakharenko, Doctor of Philological Sciences, Professor; L.I.Romashchenko, Doctor of Philological Sciences, Professor; V.O.Sobol, Doctor of Philological Sciences, Professor (Poland); N.M.Yarmolenko, Doctor of Philological Sciences.